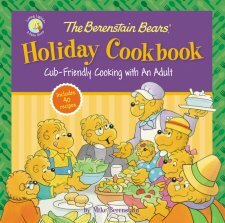 The Berenstain Bears' Holiday Cookbook by Mike Berenstain is filled with holiday inspired recipes for kids to make alongside an adult. When I first saw the book, and the cover, I assumed that "holiday" referred to the Christmas season. Although Christmas is included, it is so much more than that! This book takes you through all the most celebrated holidays of the year where food is usually a highlight! Beginning in February with scrumptious Valentine's Day treats, all the way to Christmas in December, this cookbook travels throughout the year stopping to spend time with six special holidays. Your child can cook up Tomato and Grilled Cheese Sandwiches on Valentine's day for a fun, family lunch. To make the day even more special, have him surprise the rest of the family with a Sweetheart Chocolate Cake. Easter is another fabulous time for food! My son loves making shakes and I am certain he will be excited to make the Easter Bunny Shake. The Easter Ham Panini also looks easy enough for him to try. The Forth of July is, of course, picnic time, so the Firework Fruit Explosion and Bear Country Pot of Beans look like the perfect recipes to share with a crowd. The Fall Festivities sections includes recipes with both fall and Halloween inspired treats. I don't personally celebrate Halloween but I feel fine sticking with the fallish recipes such as the Oven Roasted Corn on the Cob and Carmel Apple Nachos. Having Halloween included in this book certainly isn't a deal breaker since there are piles of other recipes that my children can enjoy trying. The last two holidays that are included are obviously Thanksgiving and Christmas. Again, filled with recipes that a child would enjoy making like Holiday Pinwheels and Cornbread and Honey Butter. If you know a child who loves to cook then this is the cookbook for them. It also has measurements in the back of the book for easy reference. Disclaimer: This review is brought to you by Book Look. All opinions stated here are my own.